Specializing in reducing taxes; business entities accounting, planning and tax preparation; planning for your lifetime and your estate; helping trustees with trust administration, accounting and taxes. Planning, advice and consulting services. We are accepting new clients but please call to make an appointment. We all take a short breath as April 15 has passed but tax season continues. This year we had a record number of tax returns that were placed on extension due to the crush of work to be done. All of the new federal tax law changes and lack of California conformity to the new federal rules have combined for a busy year so far. We will be working hard to finish all of these income tax returns as soon as we can. For our existing clients, we are here to help you avoid mistakes and take advantage of opportunities. If you need assistance, please contact us. This is critical before you make any major financial decision. 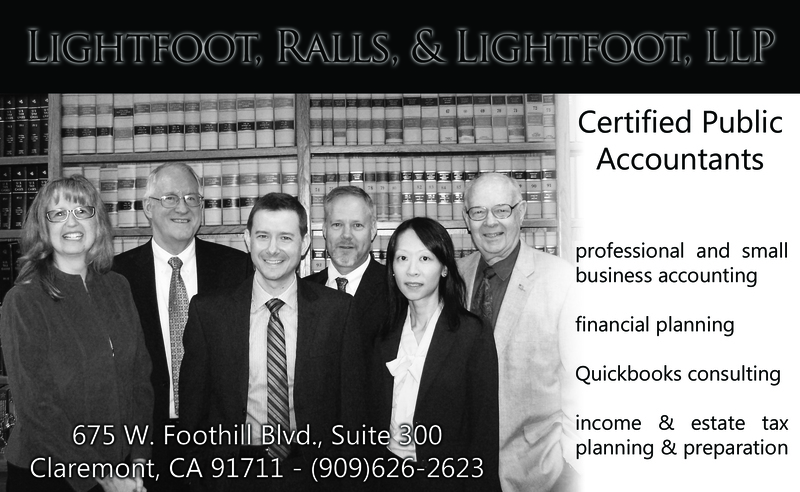 All of us at Lightfoot, Ralls & Lightfoot, C.P.A.s, L.L.P. look forward to helping you with your tax and financial planning needs.